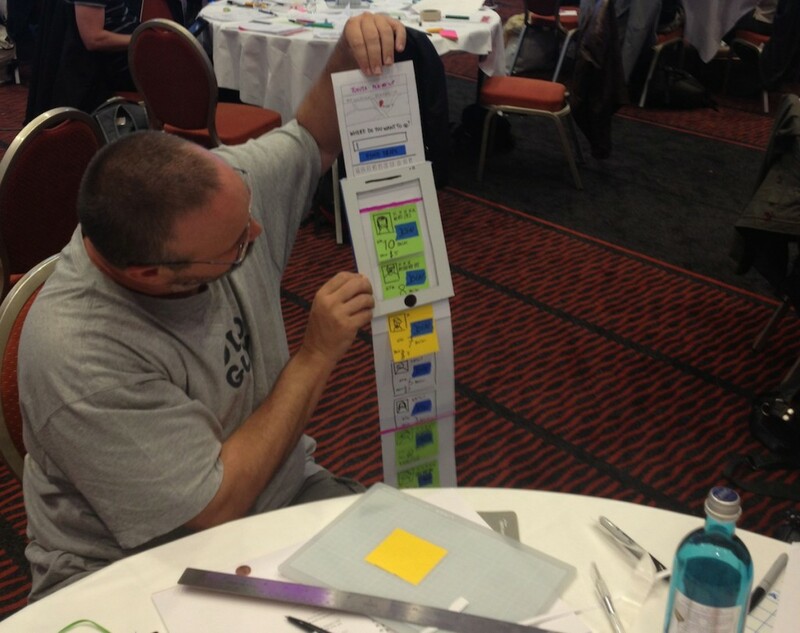 This is a personal recap of the four day workshop held by Adaptive Path in Berlin from April, 15th to 18h. Please be aware, that this summary is deliberately focused on topics of personal interest and in times deviates from the Adaptive Path lingo. In many companies (especially the traditional major ones) design still happens as an afterthought without clear connection to the overall business strategy. For design to be effective, it needs to be a product of the business goals, the customer needs and the organization’s capabilities (both in terms of technology and organizational fit). E.g. depending on whether a company is competing on cost or unique differentiators, an effective design of a product might greatly differ. Great companies are able to create a strategy where core elements are reinforced by a large number of supporting aspects – often enabling broad success of the strategy in the first place (e.g. low service price competing products relying heavily on excellent self service offers). The extent to which design is allowed to be part of the overall business strategy can be expressed in terms of the role it plays in the company. Mr. Quattlebaum distinguishes several degrees of integration with the lowest regarding design as a necessary process step of product development without clear goals and no success metrics up to where design is a core competency supporting and informing the overall business strategy (of which a good example would be Apple Inc.). Increasing the role of design in your company can only be achieved as a gradual process, as stakeholder buy-in is crucial for your success. Growing design from a cost function to a core competency with strong roots in the overall business strategy takes some serious change management. Focus on quick wins generating immediate business value and (hopefully) positive business attention. Moving beyond quick wins, effective communication of your vision is critical to gain traction with stakeholders from all parts of your organization and beyond. (Much to my own experience,) companies often lack a clear alignment between customer and business value. Increasing your alignment to the needs of your customer can be a great business opportunity (albeit this might challenge part of your business goals). In order to assess what customer value means in the case of specific offerings, a company has to go beyond pure market research and strive for insights into the mental model of customers (their needs, feelings and behaviors). Such insights are generated by design (aka user) research methods like contextual interviews, diaries, user tests etc. (see second day of the workshop). Based on these insights a company can formulate experience principles that inform the design and facilitate a consistent user experience across products and channels. A potential pitfall for pitching cross channel service strategies is the absence of management responsible for promoting cross channel performance in traditionally organized companies. Efficient creation of compelling products acknowledges the uncertainties of product development. A focus on validated learning and rigorous prioritization help to both minimize risk and accelerate time to market leading to the strategy of minimum viable products (minimum features) and services (minimum touchpoints). Another way of thinking of MVP/MSP is as a platform approach to product design enabling quick incremental evolution and at its best a continuous stream of customer delights (called “The Long Wow” by Adaptive Path’s Brandon Schauer). While execution should be driven by short feedback cycles, maintaining a consistent strategy requires a long-term vision (characterized as a “North Star”) in the form of road maps and product evolution maps that resonate with the stakeholders and (hopefully) rally them behind a common goal. 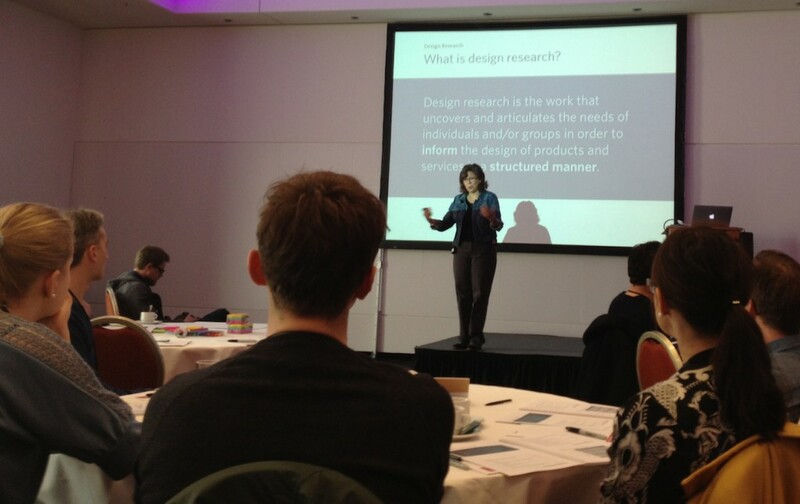 Design research (aka “User Research”) plays an important role in all phases of the design (and implementation) process. Among other things, it informs the design strategy, identifies innovation opportunities, generates insights into contexts of usage and provides vital verification for concrete designs. Design research is not the same as market research, since they differ both in focus and purpose of their research. That said, data from market research can support in planning design research efforts. Guerrilla research in coffee shops – produce quick (preliminary) insights at your local barista: Three researchers work together with one interviewing, one taking notes and one asking people in the waiting queue to participate in the interviews offering free coffee and cake in return (remark: this only works with a Starbucks-style serving process). Method “Picture Cards”: Let people select from a provided set of picture cards and words and let them arrange and annotate in a way they see fit to tell a story about the research topics. A sample introduction could be “We have some pictures and words here, which ones are resonating with your daily work routine?” This method is especially useful for gaining insight into the attitudes and feelings of people. It can inform the design and help in creating Personas. Frequent usage can be facilitated by a core set of cards, which is customized for specific tasks. Always test your interview plan with colleagues / friends before you go into the field. The AEIOU framework is a good starting point for clustering your observations. Although you might want to extend it with additional aspects to allow for coding of – among others – emotions, goals and sequence of events (time). Effective service design needs to start from a customer’s point of view (aka outside-in perspective) and has to take into account all aspects of the service experience. When (or if) taking the customer’s view, most organizations tend to focus their efforts on specific parts of the service journey (a single channel, product or touchpoint), while the customer experiences the service as the sum of all steps and circumstances of the experience. Thus, customers frequently are confused, affronted or even scared. A well designed service is an orchestrated effort of all parts of the organization(s) providing a consistent and seamless service experience. Dealing with service experience requires a much broader view than the term “user experience” which is usually associated with a single touchpoint or product. Because of its broad scope, effective design of complex services means a fundamental mind shift ultimately leading to strategic changes in the organization and processes of an enterprise. Quite a bit of careful change management might be in order to disrupt silos and alter established processes. In the end, it is the people who have to drive the change, so small gradual steps might be a better fit than an attempt at revolution. Apart from improvements for the customer and the benefits this can have for the company in itself (increase in retention and sales volume), effective service design also leads to process harmonization (potentially eradicating inefficiencies) and to higher motivated and more productive staff. This is where traditional management consulting and service design need to go hand in hand to create a system which satisfies the needs of customer and staff as much as the goals of the business. Needless to say, such a system integrating previously unrelated parts of the company will constitute challenges for the IT department. Territory Mapping collects and visualizes all elements of the (existing) service. Think of people, places, products, services, artifacts and technologies involved. This is a good starting point for your service design endeavor. It serves as first glimpse at the system’s complexity and can be used for discussion with team and stakeholders refining it along the way. Service Storming – Another method which can be used upfront before detailed research takes place (or later during service prototyping) is service storming: During a workshop with stakeholders the participants are divided into small groups and asked to create the story of an ideal service journey they are to enact for the other groups. Defining a journey should take 10 minutes, allow another 20 minutes for rehearsing, then every group gets 2 minutes to act out (transitions from one touchpoint to another are “instant”). Presenting a service journey “on stage” is a much more personal experience than mere discussions. Emotions, creativity and bonding of the stakeholders will all be spurred by the exercise. Journey (aka Experience) Maps document a service journey in its different stages (time & place) regarding all associated aspects (people, actions, emotions, needs, …). Service Blueprint is a diagram method to represent a flow of service interactions not only on the customer facing side but also including all operational aspects of the interaction steps. They are used for verification, planning and implementation of services. On Pinterest search for Service Design to find a cornucopia of diagrams. I also attended the 4th day of the workshop and found that it too was very worthwhile. But since interaction design is not my focus and for the sake of time management I decided to skip a detailed recap of this day.